Tonight we post our final Twins minor league award for April. Earlier this week, we named Nick Anderson Relief Pitcher of the Month and Aaron Slegers the Starting Pitcher of the Month. Tonight, we announce our choice for Twins Daily Minor League Hitter of the Month. There were really some strong performances and the choice was not easy. In a month where the weather so greatly effected play, especially for Rochester and Cedar Rapids, it can be difficult to factor in number of at-bats in these awards. Let’s take a look at the Top 5 hitters for the month of April, but first here are some players deserving of honorable mention. Mark Contreras - Ft. Myers Miracle - 15-43, .349/.429/.488 (917) with four doubles, one triple and seven RBI. Ben Rodriguez - Cedar Rapids Kernels - 14-45, .311/.367/.511 (.878) with six doubles, one home run and three RBI. Jaylin Davis - Ft. Myers Miracle - 15-53, .283/.406/.453 (.859) with six doubles, one home run and three RBI. Number 5 – OF LaMonte Wade - .312/.407/.418 (.825). 23-74 with one triple, two home runs and seven RBI. LaMonte Wade was the Twins ninth-round draft pick in 2015 out of the University of Maryland. He had a strong season at Double-A Chattanooga in 2017. He had a strong showing in the Arizona Fall League until a collision in the outfield led to a concussion. He earned a non-roster invitation to big league spring training where he clearly impressed the entire coaching staff. So, it was surprising that he returned to AA Chattanooga to start this season. To this point in the year, LaMonte Wade has been LaMonte Wade. He’s hit for average. He continues to get on base. He’s got more walks than strikeouts. He hasn’t hit doubles, but he has a couple of long home runs. He’s been hitting leadoff for the Lookouts, but he should be in Rochester soon. Number 4 - Chattanooga Lookouts – SS Nick Gordon - .345/.363/.536 (.898), 29-94 with four doubles, three triples, two homers and 12 RBI. As surprising as it was that LaMonte Wade returned to Chattanooga, it was just as surprising that Nick Gordon returned to the Lookouts. The Twins top pick from 2014, Gordon had a terrific first half in AA last year. He struggled in the second half, and he struggled against left-handed pitching. He also spent a lot of big league spring training at second base. Gordon is again off to a fast start, hitting for average but also hitting for good power. Defensively, he has started in 20 of 24 games at shortstop. Like Wade, Gordon should be in Rochester soon. Number 3 – Ft. Myers Miracle - Travis Blankenhorn - .305/.345/.537 (.881), 25-82 with five doubles, one triple, four home runs and 13 RBI. Blankenhorn was the Twins third-round pick in 2015. Blankenhorn spent the 2017 season in Cedar Rapids and posted a .784 OPS. He filled the stat line well, hitting 22 doubles, 11 triples and 13 home runs. He also stole 13 bases, including home twice. He moved up to Ft. Myers this year and had a strong first month. He has hit for average and provided a lot of power. He leads the Twins minor leagues in home runs. He’s still moving back and forth between third base and second base, though he’s played twice as many games at third so far. Number 2 - Ft. Myers Miracle – OF Jimmy Kerrigan .326/.388/.547 (.934), 28-86 with eight doubles, one triple, three homers and 13 RBI. The 24-year-old Kerrigan played his college ball at Virginia Commonwealth. He went undrafted and started playing the 2017 season for the River City Rascals in the independent Frontier League. After a fast start, he signed with the Twins and went to Cedar Rapids. He began 2018 with the Ft. Myers Miracle and has been terrific. In fact, as the calendar turned to May, he was promoted to Rochester (though his time there may be short). Kerrigan led the Miracle. He hit for average, got on base and provided power. He also plays a good outfield. Chattanooga Lookouts – OF Zander Wiel - .316/.402/.513 (.915), 24-76 with nine doubles, two homers and 14 RBI. Zander Wiel was the Twins 12th-round pick in 2015 out of Vanderbilt University. Upon signing, he went to Elizabethton where he was hit by a pitch and missed about a month. In 2016, he moved up to Cedar Rapids where he hit 19 home runs and led the Midwest League with 86 RBI. He hit another 13 homers in the pitcher-friendly Florida State League. This year, he will likely spend most of the season in Chattanooga, less than two hours from where he grew up in Murfreesboro, Tennessee. He had a big month of April. He hit for average, got on base and he had some big extra-base hits. It seemed as if each of his nine doubles drove in key runs for the Lookouts. He has done so while continuing to learn the outfield. He’s split time between left field and first base with Brent Rooker and done a nice job at both spots. 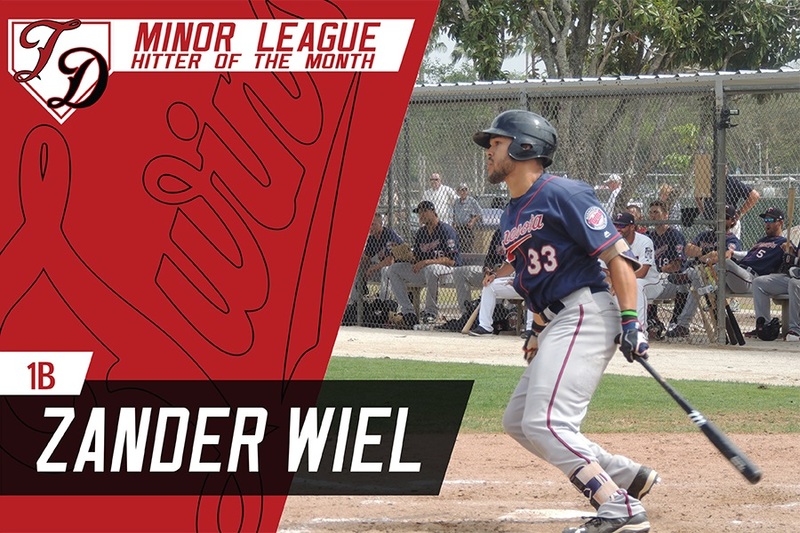 While you could argue for several players to win the award, we would like to congratulate Zander Wiel, Twins Daily’s choice for Minor League Hitter of the Month for April 2018. Feel free to share your thoughts and ask questions. Royce Lewis doesn’t even get a mention. We must be flush with hitters! Curious, Seth, why Joe Cronin isn't in your Top 5? Each segment of his triple slash is better than any of the top 5.The only negative I can see is that all three of the honorable mention Miracle players had less at bats than your Top 5.But someone with a 1.009 OPS had one hell of a month. Also am a bit surprised that two of the top five and three honorable mention all play in Fort Myers.Would expect they would have a better record with that much fire power.